Private Public Partnerships (PPPs) in Irrigation. Myth or Promising Reality? Although different forms of public private (PP) contracts have been used in the water sector for more than 50 years, their use in the Mediterranean Region concentrated in the last two decades. The number of PP projects that have been implemented in the water sector is relatively modest, but they are considered as an important tool for improving water supply performance, leveraging finance, and stimulating competition and accountability. On the other hand, several water PPP projects have faced also challenges and not lived up to expectations. Much has been learnt from success and failure and as result, there is now considerable knowledge about PPPs drawn from these experiences. 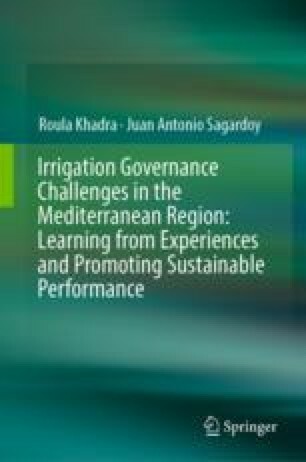 However, most of these experiences concern the domestic water supply and sanitation sector while those regarding irrigated agriculture are few and they will be documented in this chapter. This is largely explained by the fact that the payment for the water services in irrigation projects is highly unreliable and this represents a high risk for investors.